two profiles were found for Absolutesoccer.ca in social networks. Among other social networks the website is represented in Facebook and Twitter. The web server with the IP-address 67.231.26.120 used by Absolutesoccer.ca is owned by iDigital Internet and is located in Richmond, Canada. This web server runs a few other websites, mostly in the english language. 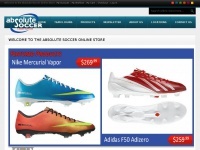 The websites of Absolutesoccer.ca are hosted by a Apache server and were developed in the programming language PHP. The online shop was build with software Magento. The markup language of the website is XHTML 1.0 Strict. The visitor analysis software Google Analytics is used to analyze the visitors of the websites. Both the inclusion of the website in search engines and follwoing of its hyperlinks is explicitly allowed.